We don't tend to see much educational manga here in the US, most likely because the modern manga audience is still mostly kids who are interested in gripping teenage action series or sappy romance — in other words, pure entertainment rather than education. Sure, we got those "Manga Guide To..." books, but the Japanese manga world is filled with comics that function simultaneously as narratives and as educational tools. 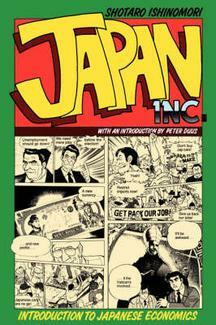 It is appropriate, then, that Japan, Inc. is not a modern manga; released in 1988 by University of California Press with an introduction by Stanford professor Peter Duus, it represents a mature, academic style of manga publishing almost completely divorced from the modern, teen-centered world of North American manga. Heck, I obtained my copy by borrowing it from my college's library, which mostly has textbooks and other purely academic texts! Released to Japanese readers in 1986 as a companion to Zeminaru Nihon Keizai Nyuumon, an economics textbook released by Nihon Keizai Shimbun (the Japanese equivalent of the Wall Street Journal), Japan, Inc. makes no bones about its status as an educational tool. Nevertheless, writer/artist and Osamu Tezuka follower Shotaro Ishinomori (Cyborg 009, Kamen Rider) makes valiant and often successful attempts at infusing a sense of humanity into the dry facts and figures that populate the comic. Our story centers around two workers at the Mitsutomo Trading Corporation: Kudo, a young businessman who works tirelessly to ensure that the "little people" are not left out in large business decisions, and Tsugawa, a ruthless schemer who's always got his eyes on ways to make the company as much money as possible. Surrounding them is a small cast of other businesspeople, including the curious and idealistic young worker Ueda, the cute and feisty secretary Amamiya, and a number of older executives who give advice to the younger workers. The bosses often serve as our teachers, explaining the long-term ramifications of events like the 1970's oil crisis on world trade and business, while Ueda's cluelessness about business gives us a character to connect to in the frequently confusing web of connections that Ishinomori walks us through. Most of the time, these explanations work out fairly naturally, thanks to a cast of characters with all different levels of knowledge and experience. Unfortunately, though, the need to explain far-reaching consequences of events can lead to confusing flashbacks, and at one point Japan, Inc. even employs the most dangerous tool of all: the DOUBLE FLASHBACK. Despite Ishinomori's valiant attempts at narrative, including some examination of the differing relationships that Kudo and Tsugawa have with their families, Japan, Inc. is absolutely an educational text. The chapters are separated based on their respective topics, and given invigorating titles like "Trade Friction," "Countering the Rise of the Yen," and "Deficit Finance." Every other page features a small footnote describing the topic at hand, and there are a few pages that simply stop the action to provide a short essay on the topic or show some graphs. (I dubbed them "economic Masamune Shirow moments.") While all this information is great to have, it's clear that the book is written for businessmen and women looking to bolster their existing knowledge of the business world, because at times the jargon can get pretty confusing for laypeople. Japan, Inc. is certainly not what most people expect from their manga: it's considerably drier than even the more subdued seinen manga series, and Ishinomori's art is an acquired taste, lying somewhere between Tezuka (Astro Boy), Mitsuteru Yokoyama (Tetsujin-28/Gigantor), and Akira Toriyama (Dragon Ball). The American version's sporadic flipping shakes up Ishinomori's panel layouts a bit too much for comfort, while the footnotes and full-page info sheets break the flow of the manga from page to page. As a result, Japan, Inc., which clocks in at just over 300 pages, is a considerably slower read than the average manga. Without any really powerful modern relevance, Japan, Inc. stands as little more than a fun little curiosity for amateur manga historians. Still, if you're interested in economics, international business, or modern Japanese history, and/or if you enjoy seeing manga-fied versions of Ronald Reagan and the Pope, Japan, Inc. might be just the right little curiosity to pique your interest. This review is based on a copy borrowed from the Folsom Library at Rensselaer Polytechnic Institute.